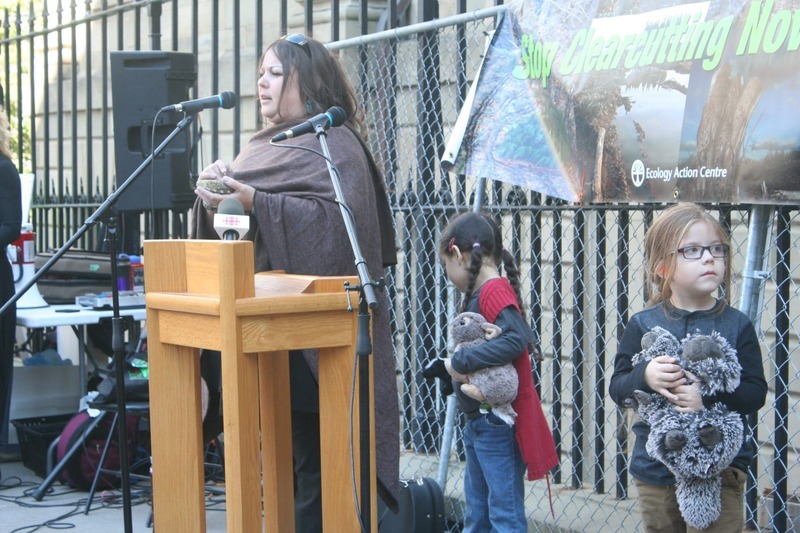 KJIPUKTUK (Halifax) – Roughly eight hundred people marched on Province House this afternoon to the sombre sounds of a funeral march, demanding a stop to unsustainable clearcut practices and the spraying of glyphosate. Not since 2011 have we seen a rally in defense of our forests this large. Speaker after speaker denounced the destructive practices endorsed by the bureaucrats in the Department of Natural Resources and their political bosses. Speakers talked of science, of beauty, and of our obligation to act as caretaker for the benefit of future generations. To mark this important event we offer up a handful of photos and a transcription of the remarks by Melissa Labrador, a Mi’kmaq woman of the Wildcat community near Kejimkujik. I just want to offer this smudge to clear the air so we only speak from our hearts, and to promote positivity into this story. So that we may talk and raise our voices and express our concerns and work together in finding a solution that will ensure that future generations, my children right here, have something to look forward to. I am a Mi’kmaw Lnu woman, earth mother and eighth generation to the land of Kejimkujik, and I strive to pass on the knowledge that was passed on to me over my lifetime by the elders who raised me. I want to share with you my concerns with the state of our forests in all of Nova Scotia, with emphasis on the area that I call home in South West Nova Scotia, Kespukwitk. I was raised deep in my culture and traditions. I have never questioned who I am. I know who I am. I have known the forests and the knowledge it holds since I was a little girl. It is how I raise my children. In my upbringing science and spirituality remained as one, there was no separation. They require each other. There was no rift between them in the beginning. This (rift) was man made. We are people who are connected to the land as much as the land is connected to us. Our cultural future depends on the state of the forests. We live in a time of reconciliation. We live in a time that people are looking to reconnect with their cultural identity that was stolen from them. The forest is a big part of that identity. Our traditional medicines within these forests are a big part of our identity. The raw materials we use are a big part of our identity. Ecotourism and cultural tourism are becoming a growing demand, and that is an area which I work in. The world wants to learn who we are, as Mi’kmaq and Lnu people, and our people are reviving traditions of long ago. such as birch bark canoe building, which I have the opportunity to do with my father, basketry and so on. This all depends on the health of our forests. Removal of our forests removes our identity, my identity, my children’s identity, and many others here. Removal of the forest removes the ability to revive almost lost arts. The removal of the forest removes our raw materials required to pass on these traditions and extend to our next generations. I know our government has a good plan to create protected areas,, but many of those areas are waiting for their final designation, and I am hoping these can be finalized and that we can protect additional areas. I don’t have all the answers, but I ask those who make the decisions to please consider the impact that allowing our forests to be disrespected through clearcutting and over-harvesting will have on so many people, especially my people, the Lnu, and my family who depend on a livelihood through reviving our traditional culture and arts. Our land in South West Nova Scotia, surrounding Kejimkujik Park, are rich in cultural and traditional history. As a Mi’kmaq person I have a responsibility. We all have a responsibility as people of Nova Scotia to respect our forests and keep her and her creatures safe for generations to come. Next Post Danny Cavanagh: Why the secrecy about Nova Scotia’s health care deal? It’s disheartening and an insulting use of nomenclature when the term fibre in place of forests or trees. For those who truly appreciate the forest we see more than commercial uses, we see roots, bark, sap, frame work for canoes, medicine and tea. Not the satisfaction of fibre for the greedy mans hunger! Thank you for your coverage of this significant public event in Halifax on the 19th. As a participant in this demonstration I was dismayed to notice an almost complete absence of media coverage by the big 3 – CBC, ATV & Global. My question is: who managed to gag each of these local news outlets so thoroughly? Global did do a brief story which qualifies as under reporting in my books. Anyway, good for you and your work! CBC had a microphone right on the podium. They were there.